Instant Pots. Have you tried one yet? My parents bought one for me for my birthday this year and I’ve only just recently started to play around with it more. Now I can’t quite get over how fast you can cook a whole chicken in it. 30 minutes?! 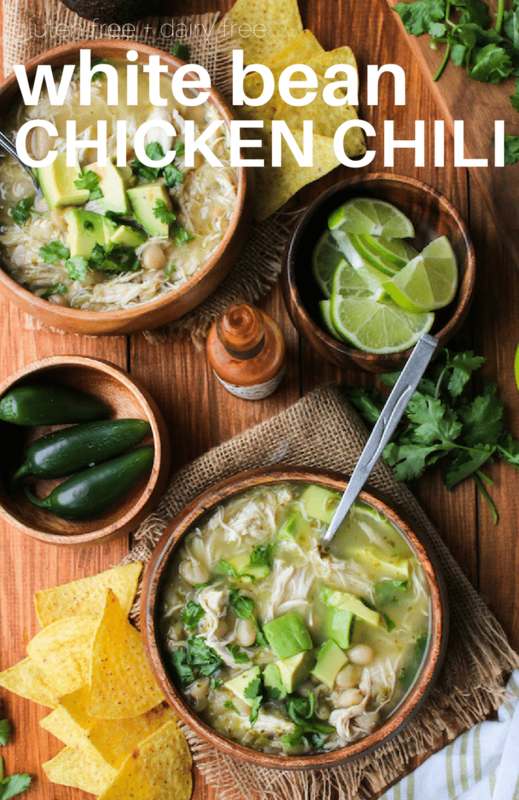 It’s got the set and forget features of a slow cooker, but is great for people like me who forget to actually set the temperature only to realize the mistake hours later at dinner time that you have nothing prepared but raw chicken….or is that just me? 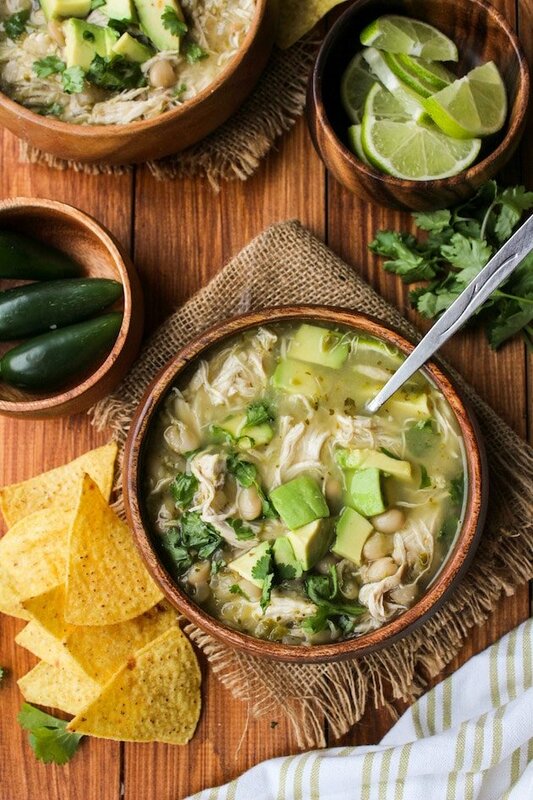 I have my mom to thank for not only my instant pot, but this white bean chicken chili recipe as well! She made this a few times when Mike and I were in Arizona and I loved it every single time. It hits the spot for me even more so now that we’re back in England where the rain (seemingly) never stops. This time of year I want little more than to sit down in an oversized sweater with a big bowl of soup. Cozy vibes forever! 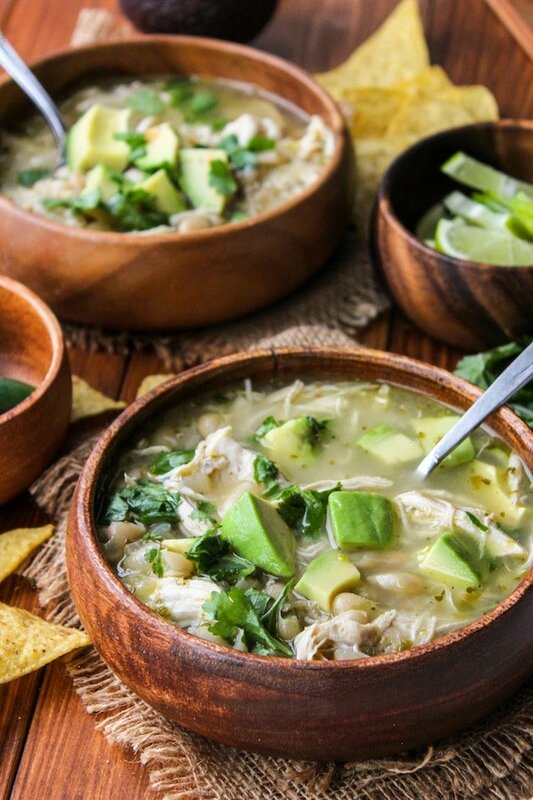 Making this in the instant pot is the easiest dinner imaginable, because you literally cook it all in the one pot. After quickly sautéing the onion, pepper, and garlic just pile on the seasonings, chicken, and stock. Give it all a quick stir, push the appropriate buttons and go. All of that with minimal cleanup afterwards! Everything you want in a meal that can feed your family! 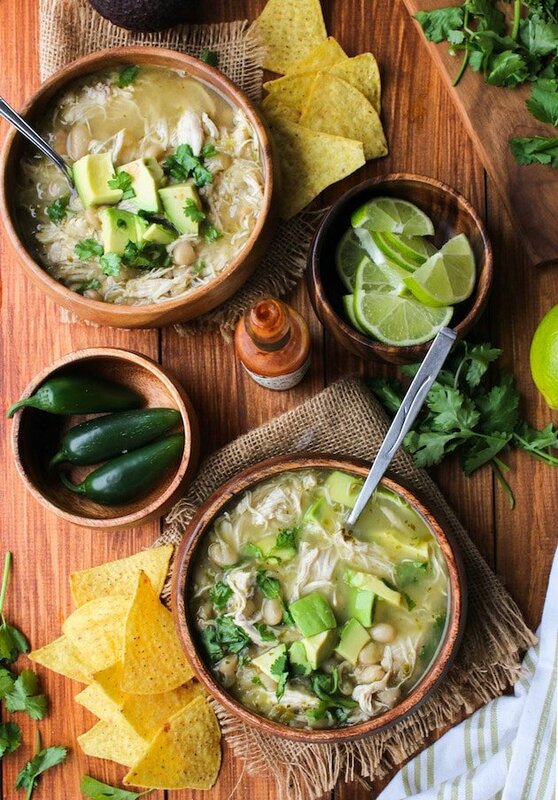 Don’t forget to #asaucykitchen on instagram if you make these white bean chicken chili soup. We love seeing what you make! You can also post your pictures to our facebook page! Add the olive oil to the Instant Pot (affiliate link) and press the "Sauté" button. Once the oil is warm add the onion and jalapeño pepper. Use a wooden spoon to stir and cook until the onion and pepper are fragrant and soft, about 3 minutes. Add the crushed garlic and stir for another minute. Add the remaining ingredients to the pot and give it all a quick stir. Press the "Keep Warm/Cancel" button to stop the sauté function. Secure the lid and make sure the steam valve is set to closed. Press 'Manual' or 'Pressure Cook' and set the timer to 12 minutes. Once the steam has been fully released remove the lid of the instant pot. Use a couple of forks to shred the chicken. For a thicker consistency you can use a potato masher to mash up some of the beans. Taste the soup and season accordingly. Add more salt/pepper/etc. I like to squeeze a couple of limes at the very end for added brightness, but that's up to you. How many servings? Trying to calculate for ww points. Thank you! Already made it and it is delicious!! Night 2 of 2 your recipes. Last night was the sweet potato carrot soup, that was amazing! Tonight, this! I do not have an insta pot, but made it like a regular soup. Perfect!i added cilantro and green onions.. Topped with home made tortilla strips and lime, then jack cheese.. Once again Sarah, nailed it! 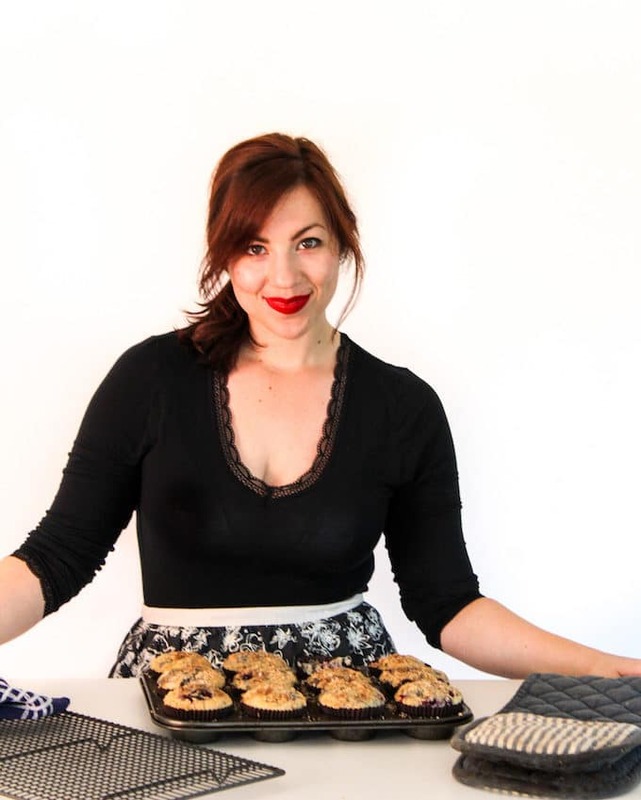 Thank you for making gluten free fun! That makes me so happy to hear! Thanks again so much for coming back to let me know what you thought! It really makes my day and I’m so happy I could help! I’ve been looking for the “killer” recipe since I bought my Instant Pot about a month ago. This is it. Thanks, Bob! Really glad you enjoyed it! Planning to make this today! I’m surprised by 30 min on bean/chili since chicken usually goes faster. You didn’t have any issues with the chicken being overdone? Just got a pressure cooker and have been looking for recipes! This looks amazing.